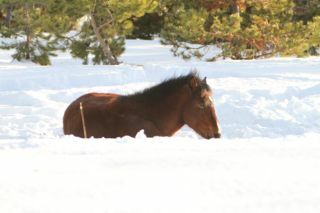 Well the snow is certainly here this year in wild horse country and it keeps accumulating. Anywhere from 18 to 36 inches is currently laying on the ground with the winds swirling it around making it deeper in some spots. 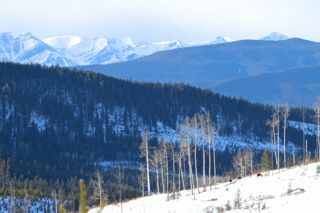 It is starting to look like it may be a hard winter, not only on the wild horses, but all the other wildlife that they share their range with. A winter like this puts so much stress on the wild horses they certainly do not a capture season declared on them to add to it. 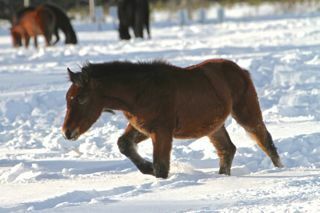 As the snow deepens the horses have to work harder to find the nourishment that they need in order to sustain their health and well being. 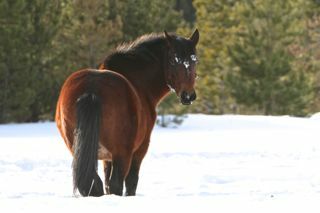 Because of their broad wide hooves, they are able to push enough snow aside to find the grass buried underneath. This is unlike the deer and the elk who with their small cloven hooves, find this extremely difficult. This is one of the reasons you will find them following the horses to find feed. Mom, the snow is so deep. 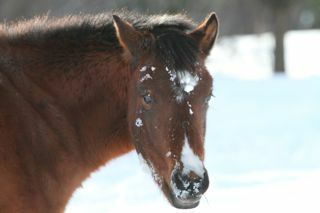 Young horses from this year’s foal crop are finding their first winter tough. 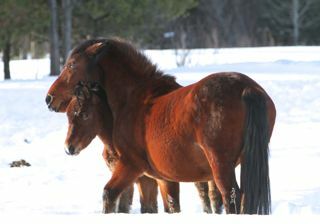 Although they are still able to get warm milk from their mare, they still need to forage for feed to allow their bodies to continue to grow and stay healthy. 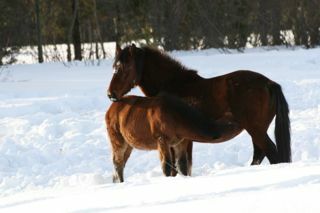 Also with such a hard winter, the young horses still need the nurturing of their mares and other horses to ensure they are okay. The snow is also making it difficult on us to be able to check on the welfare of a vast majority of the wild horse herds. We are limited to being able to explore only the roads and trails that have been plowed so far this winter. Although a winter like this doesn’t seem to be that common anymore, it is one like this makes me wish I could afford a snow machine to travel trails we normally do when it’s dry or much less snow. The worry is always there about how the herds that we know are doing. As far as a capture season goes, there is still no decision from the new minister, the Honorable Robin Campbell. We are requesting that if you are interested in helping get the horses better protection and having no capture season, write a letter or email the minister expressing your concerns. The steering committee meetings that have been set up by the ESRD to look into the management of the wild horses are still ongoing. 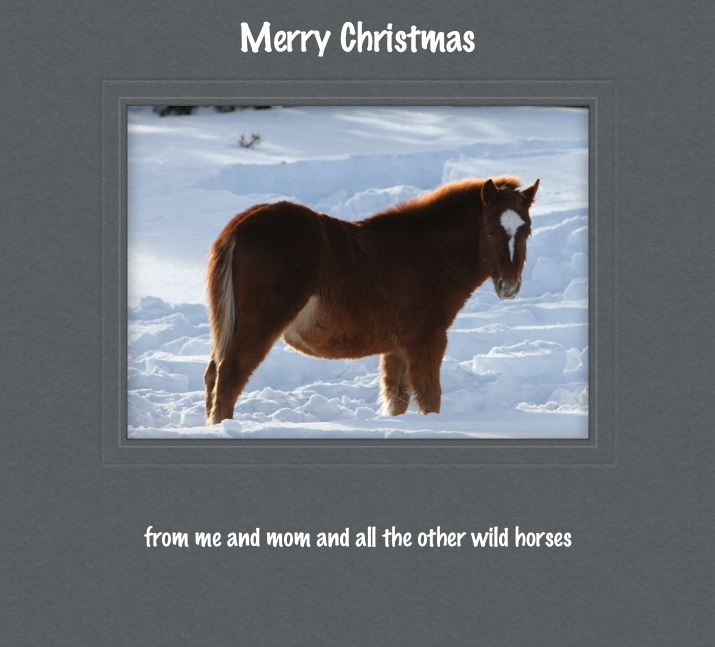 Unfortunately an email and comments received from one of the stakeholders, the president of a group representing hunters in Alberta, signify the extreme negativism that is out there against the wild horses. The email compared the issue of the wild horses with the feral pigs which is completely ludicrous but shows us their group’s complete distain for anything that they feel don’t belong anywhere. WHOAS feels based on the comments from this group that they want the wild horses shot and a bounty put on their heads like they did with our wolves. They are so narrow-minded and see no value in the wild horses. However a vast majority of the Albertans we talk to recognize the value and importance of these wild horses as a tourism potential and integral part of our Alberta foothills ecosystem. As often as we can we will continue to travel the west country wherever we can make it checking on your wild horse herds and keeping you up-to-date. The calendars we have left are getting down so please let us know as soon as you can if you would like to purchase one.